It’s a lovely morning. Nurse Jenie has a smile plastered on her face as she starts her day in the hospital. The sun shines brightly, the weather’s not-so-hot, no traffic today. Everything was just going right until she enters the Intensive Care Unit Complex and smells something unpleasant. “Ugh, what is that smell?” she asks as she puts her back in the locker and proceeds to receive endorsement from the outgoing nurse on duty. She scans through the chart as the outgoing NOD tells her that the patient is due for dressing every shift. Confused, she accompanies the outgoing NOD to do bedside endorsement and that’s where she finds out that the patient has a big bandage covering the buttocks part. “Aah, so that’s where I’m going dress the patient later,” she says as the outgoing NOD tells her that the affected part is a bedsore gone bad. Check for red skin over bony areas since this is usually the place where bedsores start to develop due to the pressure. You may ask a co-worker to assist you I holding the patient as you assess those hard to see places. For conscious patients, you may remind them from time to time to change positions as indicated. For those unconscious, the nurse may perform the turning himself. Usually, it is advised to turn the patients to side at least every two hours. Avoid sliding and keep the head of the bed as low as possible to help prevent damage to the skin from sliding down in bed. Pillows and foam edges may be used to do this to keep bony areas from touching one another. For example, you may put a pillow or foam wedge between the patient’s knees to keep them from pressing on one another or put a foam pad or a pillow under the legs from mid-calf to ankle to keep the heels from touching the bed when the patient lies on his back. The nurse may also remove extra sheets or bedding from underneath the patient ad check for and remove tubing, such as oxygen tubing or IV tubing underneath the patient. A “lifter” may be used as a sheet to help lift and avoid sliding the patient when positioning. Also, it may be advised for conscious patients to avoid cushions that reduce blood flow to your tissues as they may increase their risk for a pressure ulcer. Skin care is essential in preventing bed sores. Always keep the patient’s skin dry, clean and moisturized. Mild soaps and warm water may be used in cleaning the skin. Gently pat the skin and avoid rubbing. Simple steps like this will prevent exposing the skin to moisture and bacteria. In nursing, we may be preoccupied with other nursing tasks that we deem as more important that we sometimes forget some things that also need to be attended to. Amidst our busy schedule, let us take time to consider our patient. Who knows, simple things such as turning your patients may save him from further complications, and in your case added nursing tasks in the future. This entry was posted in Nurses' Notes and tagged pressure sores, Prevent Pressure Sores. Bookmark the permalink. 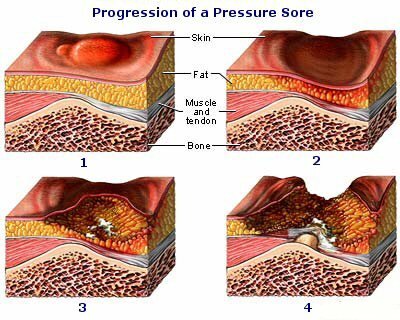 They should be called pressure ulcers as they are not all painful. Try to initiate a preventive skin care program and all patients should be assessed on admission. Of course use a validated skin risk assessment form. There is a speciality organization where nurses can obtain certification in WOUND OSTOMY OR INCONTINENCE. They are called WOCN nurses and have much information on the web. I am a retired WOCN nurse.